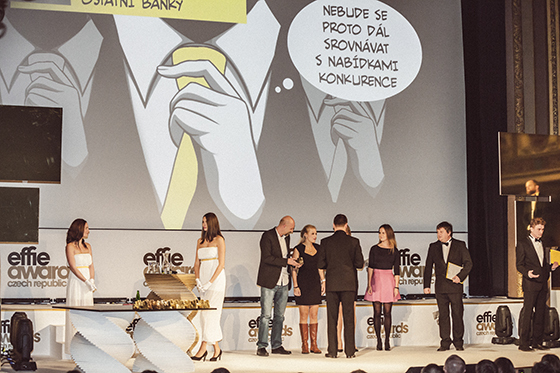 The 2015 Effie Czech Republic Awards Gala took place at Lucerna Cinema on November 4. There were seven Gold Effies, four Silver Effies, and six Bronze Effies awarded. Young & Rubicam Prague won two Gold Effies for the Staropramen Brewery and RWE Energie campaigns in this year's competition honoring marketing effectiveness. The other gold awards were presented to Ogilvy & Mather for their campaign for Air Bank, McCANN Prague for their campaign for Vodafone, Comtech Group for the campaign “Women for Women,” Wunderman as co-creator for RWE Energie, Zaraguza for their campaign for Kofola, and finally Dynamo design and MORIS design for the rebranding and redesign of Teta stores. Additionally, Momentum Czech Republic was the most acclaimed agency of the evening with three Bronze Effies. Trophies were awarded in 7 categories: Food, Beverage, Consumer Goods, Financial Services, Other Services, Small budget and lastly Social, Ecological, Cultural Marketing. The most competitive categories were Financial Services and Other Services, which alone generated four Gold, two Silver and two Bronze Effie Awards. The Effie Awards competition has been held in Czech Republic since 1997. Traditionally, the awards ceremony is held in the city center at the Lucerna Cinema. The cinema is part of the monumental art-nouveau Lucerna Palace, built in the early 20th century.